The last time a signed piece of Babe Ruth memorabilia caused this many problems, Scotty Smalls hit his stepdad’s baseball to the Beast in The Sandlot. Unfortunately, James Earl Jones wasn’t around to just give Reese and Finch another in this case. 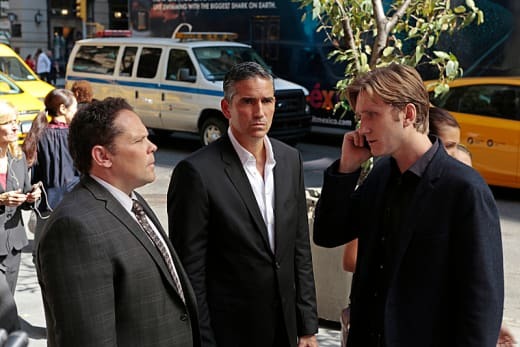 Person of Interest Season 3 Episode 7 went for the long con with a hypnotherpist scamming his patients, stealing their money and getting himself tangled up with HR. It wasn’t the most unique idea the series has had and the twists and turns of the con artist were relatively predictable, but putting Reese and Finch back into the lead positions and providing the main characters with their signature charisma - along with some staple action sequences thrown in - kept the hour from becoming something boring and cliche. Allowing Finch to do more than walk the dog or sit behind his computer is always a nice addition. I’m glad he was able to interact with the person of interest, but I kept expecting some flashbacks while he was asleep rather than just tricking the con man. Still, it was Finch’s interactions with Root that proved to be the most interesting and compelling. Even behind bars, Root still plays crazy and in control like nobody else; I enjoyed seeing her try and toy with Finch about the Machine picking her rather than him. It’s going to be tough to break her spirits, but I have faith that Finch is a patient man. But just what is coming for the future? Finch started something with the Machine, but can he be the one to stop it? Or will he even want to when the time comes? Reese was more humorously pissed off throughout the hour in that dry sarcastic way he handles every situation. From comparing his job to babysitting... to frustratingly tracking down the con man... to smashing Terney’s face in with a chair, it was great to see Reese in action rather than just shadowing behind Shaw. And while Shaw wasn’t absent, her role was much more low key. Still, she was able to toss in a few quips and kneecap shots that viewers have grown to see from her over Person of Interest Season 3. I do like when the case of the week story mixes into the larger story, but there was something rather cartoonish about HR’s antics, and they are probably my least favorite of the villains that Reese, Finch and the gang have to face off with. Sure, the inner workings of the money laundering and connections with the Russians were further spelled out, but would the head of HR really talk with Simmons about the corrupt sect of the police force’s dealings and problems out in the open? Even Terney, who I liked seeing stand up to Simmons and was hoping to see HR crumble from the inside, ended up getting shot by Carter. Although, not before he acted like some cheesy villain preparing for a monologue when he “caught” Carter and Laskey up to no good. And I’m not surprised Laskey was killed, but I was hoping he might stick around for a little bit longer. 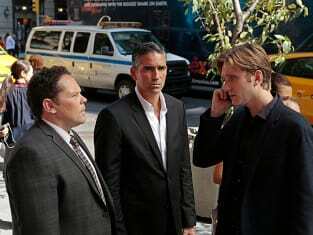 He really was starting to see the other side in a way that Fusco was able to when Reese first turned him back in Person of Interest Season 1. But two HR deaths is probably going to put Carter right into their cross hairs. And is that something Elias can get her out of? Or is he going to stick to drinking wine and playing chess in the dark? I was thrilled that Fusco also was more involved in the hour than he has been for most of the season. I’m sure it’s tough to juggle screen time for the characters and make it feel natural, but he’s been noticeably absent. Thank goodness he was able to swoop in and save Carter from the Swede, work on his “hollow-point motif” blood art, giving some expertise on the signed baseball. Who knew he was a Mets fan? While “The Perfect Mark” wasn’t the perfect episode, it still found ways to be fun and entertaining in true Person of Interest fashion. I am hoping we see some other past bad guys reappear besides HR and the new group, Vigilance, but it's clear that the season has laced up its PF Flyers and headed towards something big.